Eli Herschel Wallach (/ˈiːlaɪ ˈwɔːlək/; December 7, 1915 – June 24, 2014) was an American film, television and stage actor whose career spanned more than six decades, beginning in the late 1940s. Trained in stage acting, which he enjoyed doing most, he became "one of the greatest 'character actors' ever to appear on stage and screen", with over 90 film credits. On stage, he often co-starred with his wife, Anne Jackson, becoming one of the best-known acting couples in the American theater. As a stage and screen character actor, Wallach had one of the longest ever careers in show business, spanning 62 years from his Broadway debut to his last major Hollywood studio movie. For his debut screen performance in Baby Doll (1956), he won a BAFTA Award for Best Newcomer and a Golden Globe Award nomination. Among his other most famous roles are Calvera in The Magnificent Seven (1960), Guido in The Misfits (1961), and Tuco ("The Ugly") in The Good, the Bad and the Ugly (1966). Other notable portrayals include outlaw Charlie Gant in How the West Was Won (1962), Hitman Leon B. Little in Tough Guys (1986), Don Altobello in The Godfather Part III, Cotton Weinberger in The Two Jakes (both 1990), and Arthur Abbott in The Holiday (2006). One of America's most prolific screen actors, Wallach remained active well into his nineties, with roles as recently as 2010 in Wall Street: Money Never Sleeps and The Ghost Writer. In 1988, Eli Wallach was inducted into the American Theater Hall of Fame. Wallach has also received BAFTA Awards, Tony Awards and Emmy Awards for his work, and received an Academy Honorary Award at the second annual Governors Awards, presented on November 13, 2010. In March 2017, the Harry Ransom Center announced the acquisition of Wallach's papers, along with those of his wife. It will be made public when cataloging is complete. Wallach was born in Red Hook, Brooklyn, at 156 Union Street, a son of Jewish immigrants Abraham and Bertha (Schorr) Wallach, both from Poland. He had a brother and two sisters, with his family being the only Jews in an otherwise Italian American neighborhood. His parents owned Bertha's Candy Store. Wallach graduated in 1936 from the University of Texas with a degree in history. While at the university, he performed in a play with fellow students Ann Sheridan and Walter Cronkite. In a later interview, Wallach said that he learned to ride horses while in Texas, adding that he liked Texas because "it opened [his] eyes to the word friendship." He explained, "You could rely on people. If they gave you their word, that was it ... It was an education." In 1961, Wallach co-starred with Marilyn Monroe, Montgomery Clift and Clark Gable in The Misfits, Monroe's and Gable's last film before their deaths. Wallach never learned why he was cast in the film, although he suspected that Monroe had something to do with it. Its screenwriter, Arthur Miller, who was married to Monroe at the time, said that "Eli Wallach is the happiest good actor I've ever known. He really enjoys the work." Some of his other films included The Lineup (1958), Lord Jim (1965) with Peter O'Toole, a comic role in How to Steal a Million (1966), again with O'Toole, and Audrey Hepburn, and as Tuco (the 'Ugly') in Sergio Leone's The Good, the Bad and the Ugly (1966) with Clint Eastwood, followed by other Spaghetti Westerns, such as Ace High. At one point, Henry Fonda had asked Wallach whether he himself should accept a part offered to him to act in a similar Western, Once Upon a Time in the West (1968), which would also be directed by Leone. Wallach said "Yes, you'll enjoy the challenge," and Fonda later thanked Wallach for that advice. A pivotal moment in Wallach's career came in 1953, when he, along with Frank Sinatra and Harvey Lembeck, tried out for the role of Maggio in the film From Here to Eternity. Sinatra biographer Kitty Kelly notes that while Sinatra's test was good, it had none of the "consummate acting ability" of Wallach. Producer Harry Cohn and director Fred Zinnemann were "dazzled" by Wallach's screen test and wanted him to play the part. However, Wallach had previously been offered an important role in another Tennessee Williams play, Camino Real, to be directed by Elia Kazan, and turned down the movie role. Wallach said that when he learned that the play had finally received financing, he "grabbed" the opportunity: "It was a remarkable piece of writing by the leading playwright in America and it was going to be directed by the country's best. There really wasn't much of a choice for me." The film, however, went on to win eight Academy Awards, including one for Sinatra, which revived his career. Wallach recalled afterwards, "Whenever Sinatra saw me, he’d say, 'Hello, you crazy actor!'" Wallach, however, claimed to have no regrets. On November 13, 2010, at the age of 94, Wallach received an Academy Honorary Award for his contribution to the film industry from the Academy of Motion Picture Arts and Sciences. A few years prior to that event, Kate Winslet told another audience that Wallach, with whom she acted in The Holiday in 2006, was one of the "most charismatic men" she'd met, and her "very own sexiest man alive." Between 1984 and 1997, he also did voice overs in a series of commercials for the Toyota Pickup. Eli Wallach was married to stage actress Anne Jackson (1926–2016) for 66 years from March 5, 1948, until his death. They had three children: Peter (born 1951), Roberta (born 1955), and Katherine (born 1958). Roberta played an epileptic teenager in Paul Zindel's The Effect of Gamma Rays on Man-in-the-Moon Marigolds and appeared in several other movies. Wallach was a strict teetotaler and once asked the director John Huston for advice on how to play a "drunk" scene during the filming of The Misfits. A few years before 2005, Wallach lost sight in his left eye as the result of a stroke. Wallach died on June 24, 2014, of natural causes at the age of 98. He was survived by his wife of 66 years, three children, three grandchildren and a great-grandchild. His body was cremated. Katherine Wallach told The New York Times Anne Jackson died on April 14, 2016, aged 90, at her home in Manhattan. ^ a b c d video: "Eli Wallach Tribute at the TCM Classic Film Festival 2010" on YouTube, 4 minutes. ^ "Papers of Actors Eli Wallach and Anne Jackson Acquired". www.hrc.utexas.edu. Retrieved March 6, 2017. ^ a b c d e f Ross, Lillian, and Helen. The Player: A Profile of an Art, Simon and Schuster (1962), pp. 159–160. ^ a b "Eli Wallach Knows His Lines" – Forward.com. ^ a b "Eli Wallach Biography (1915–)". Filmreference.com. Retrieved January 2, 2011. ^ "Full text of "The Player A Profile Of An Art"". Archive.org. Retrieved January 2, 2011. ^ "Alumni in the News: Eli Wallach to receive lifetime achievement award" Archived February 11, 2011, at the Wayback Machine, Alumni and Friends, Department of History, University of Texas, Austin. ^ a b The Alcalde: Texas, March 2000. ^ "Marian Seldes, Eli Wallach to Receive CCNY Alumni Finley Award", Newswire, City College of New York, October 19, 2010. 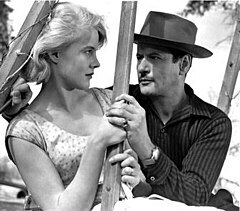 ^ "Biography: Eli Wallach", The New York Times. ^ "Eli Wallach, veteran actor, dead at 98", CBS News, June 25, 2014. ^ Gordon, Mel. Stanislavsky in America: An Actor's Workbook, Routledge (2010), p. 178. ^ "Eli Wallach Biography". Starpulse.com. Retrieved June 26, 2014. ^ Lewis, Robert (1996). "Actors Studio, 1947". Slings and Arrows: Theater in My Life. New York: Applause Books. p. 183. ISBN 1-55783-244-7. ^ Gottfried, Martin. Arthur Miller: His Life and Work, Da Capo Press (2003), p. 245. ^ a b Harding, Les. They Knew Marilyn Monroe: Famous Persons in the Life of the Hollywood Icon, McFarland (2012), p. 154. ^ a b c d Simonson, Robert (June 25, 2014). "Eli Wallach, Seasoned Star of Stage and Film, Dies at 98". Playbill. Archived from the original on August 17, 2014. Retrieved June 26, 2014. ^ Mosel, "Leading Lady: The World and Theatre of Katharine Cornell. ^ David Ng. "Eli Wallach, an Actors Studio veteran and theater stalwart". Los Angeles Times. Retrieved June 25, 2014. ^ http://theeveningclass.blogspot.com/2010/05/tcm-classic-film-festival-2010-good-bad.html "The Evening Class", TCM interview with Robert Osborne, May 6, 2010. ^ a b c d Berkvist, Robert (June 25, 2014). "Eli Wallach, Multifaceted Actor, Dies at 98". The New York Times. ^ a b c Scott, A. O. (November 4, 2010). "Eli Wallach, From Brooklyn to Honorary Oscar". The New York Times. ^ Heintzelman, Greta. Critical Companion to Tennessee Williams, Infobase Publishing (2005), p. 33. ^ Wallach, Eli. The Good, the Bad, and Me: In My Anecdotage, Houghton Mifflin Harcourt (2005), p. 172. ^ Young, Jeff. Kazan: The Master Director Discusses his films – Interviews with Elia Kazan, Newmarket Press (1999), p. 224. ^ a b McNulty, Charles. "Eli Wallach had the power to illuminate a character on stage and screen", Los Angeles Times, June 25, 2014. ^ a b c "Eli Wallach dead: Star of The Good, the Bad and the Ugly dies aged 98". Mirror. U.K. June 25, 2014. ^ "Eli Wallach: a career in clips", The Guardian, June 25, 2014. ^ Churchwell, Sarah (December 27, 2005) . The Many Lives of Marilyn Monroe. Granta Books. p. 266. ISBN 978-0-312-42565-4. ^ Miller, Arthur (1987). Timebends. New York: Grove Press. p. 485. ISBN 0-8021-0015-5. ^ Schochet, Stephen. Hollywood Stories: Short, Entertaining Anecdotes about the Stars and Legend, Hollywood Stories Publishing (2010), p. 118. ^ McGilligan, Patrick. Clint: The Life and Legend, Macmillan (1999), p. 154. ^ Kelly, Kitty. His Way: An Unauthorized Biography Of Frank Sinatra, Random House (2010). ^ Welsch, James M. and Phillips, Gene D. The Francis Ford Coppola Encyclopedia, Scarecrow Press (2010), p. 273. ^ "List of Emmy Nominations 2007". TVWeek. July 19, 2007. Archived from the original on September 24, 2012. Retrieved June 26, 2014. ^ Armour, Philip. The 100 Greatest Western Movies of All Time, Morris Book Publishing (2011), p. 70. 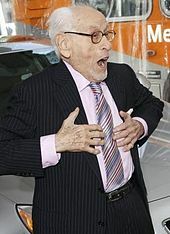 ^ "Eli Wallach, prolific U.S. character actor, dies at 98", Reuters, June 25, 2014. ^ Eli Wallach's acceptance speech, Honorary Academy Award, Governors' Award ceremony on YouTube, November 13, 2010. ^ The Holiday - Arthur's award ceremony. August 17, 2011. Retrieved February 13, 2016 – via YouTube. ^ Reuters Editorial (June 25, 2014). "Eli Wallach, prolific U.S. character actor, dies at 98". Reuters. Retrieved February 13, 2016. ^ McFadden, Robert D. (April 13, 2016). "Anne Jackson, Stage Star With Her Husband, Eli Wallach, Dies at 90". The New York Times. The New York Times Company. Retrieved May 30, 2018. ^ Staff (April 13, 2016). "Actress Anne Jackson, Widow of Eli Wallach, Dies at 90". Variety. Penske Business Media, LLC. Retrieved May 30, 2018. ^ Barnes, Mike (April 13, 2016). "Anne Jackson, Acclaimed Actress and Widow of Eli Wallach, Dies at 90". The Hollywood Reporter. Retrieved May 30, 2018.